I am continually trying to think of ways to use the iPads in a producing or student creation way, rather than a "lets play a game" kind of way. I am also trying to be as paperless as possible this year, so using the iPads is a win, win situation. I share the 20 iPads with another teacher so in all honesty, I only have 10 during math and I usually use 4 with my guided math groups, which leaves me 6 for math stations. My students are partnered up and do 2 stations a day. I have 10 stations that I change every 2 weeks. I try to link my math stations to what we are currently learning about and a review of things we have already learned. Here are a couple of math stations we are using this week and links for you to download the instructions if you wish. Students will be given dominoes, the "I Can Card" and 2 iPads (one for each student) in their Math Station bucket. Students will be asked to measure three different books in the classroom with their dominoes. 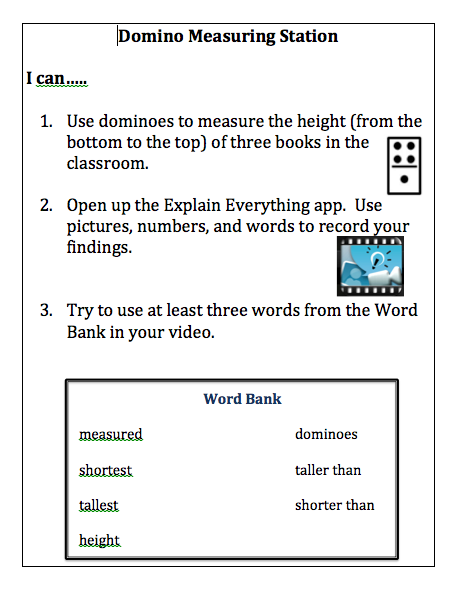 The second task is to open the "Explain Everything" app, take a picture of their measurements and explain their thinking using at least three words from the word box in their video. If you are interested in downloading the task card that I created, please download it here. Students will be given the "I Can Card" and 2 iPads (one for each student) in their Math Station bucket. Students will be directed to click on the "Youtube" icon on their iPads. Students will be directed to a reading of "The Napping House". Here is the link. 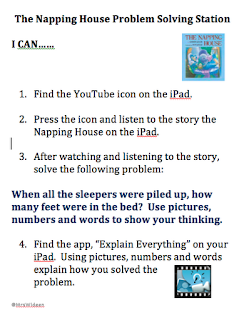 Students will then open the "Explain Everything" app and will answer a math problem using pictures, numbers and words. If you are interested in downloading the task card that I created, please download it here. During guided math, students are working on telling time to the hour in grade 1 and to the quarter hour in grade 2. I have uploaded a picture of a clock face to their dropbox accounts so I we can work on this with them. I will have students draw the hands on the face of a certain time and record the time, while recording themselves with either the "ShowMe "app or the "Explain Everything" app. While students are doing this I am taking notes in Evernote for assessment reasons on my iPad or computer. I have another iPad station involving my children's left over Halloween candy and tying in google forms and graphs. I am still working out the details. (New Math Stations start on Thursday of this week.) I will post pictures and this last station next week. I am happy to say that all my other math stations this round do not involve paper except for the laminated directions and the laminated activities I have created. No paper to send home! Students will be taking pictures or videos of their work and uploading their work to their blogs to share with friends and family. Are you doing math stations this year or do you have an iPad math station? I would love to hear what you are doing in your classroom! You have some great ideas! Thanks for sharing! Do you have to have an email address to use explain everything or publish from it? Hii Cindy, No you do not need an email address to use explain everything. My students are in grade 1 and 2 so they do not have email addresses. You used to have all these cards in a Google Drive. Are they gone and you are using TPT now? I copied your folder about a year ago but now I can't find that file link. They are now available if you purchase my book. There is a new website www.innovatewithipad.com where the cards are stored. The password is in the new book.